The Army and Homeland Security develop a high-tech simulator for teachers and first responders. ORLANDO, Fla. — The shooter rapidly fires through the front doors of an elementary school with an assault rifle and blasts his way down the hallway. Children are frozen in fear. Teachers quickly try to decide: Barricade the doors, or make a run for it with their students? 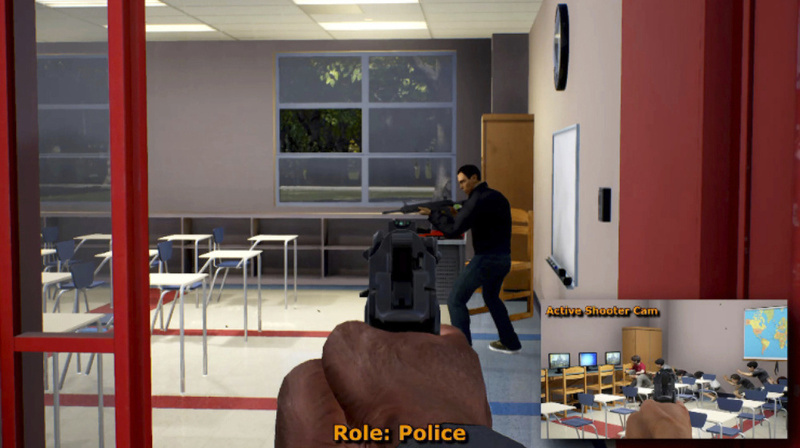 Using cutting-edge video game technology and animation, the U.S. Army and Homeland Security Department have developed a computer-based simulator that can train everyone from teachers to first responders on how to react to an active shooter scenario. The training center is housed at the University of Central Florida in Orlando and offers numerous role-playing opportunities that can be used to train anyone in the world with a computer. Originally designed for police and fire agencies, the civilian version is now being expanded to schools to allow teachers and other school personnel to train for active shooters alongside first responders. Homeland Security officials say the schools’ version should be ready for launch by spring. Another EDGE program, which was launched in June, has an active-shooter scenario involving a 26-story hotel that includes numerous possible environments for first responder training: a conference center, a restaurant, or office spaces. As many as 60 people can train on the program at once and can be located anywhere. School safety advocates say safety training gets pushed to the back burner until a tragedy happens. Amanda Klinger, director of operations for nonprofit Educators School Safety Network, said this new program could help change that.